I promise to bake an actual holiday cookie this weekend, but for now here’s a caramel topped brownies recipe based on one from a poultry farmer named Mary Lou who submitted it to Cooking Pleasures magazines. About Cooking Pleasures — it’s not an easy magazine to come by unless you are a member of Cooking Club of America. Some of my friends are and have spoken very highly of the magazine, which I’d never seen until yesterday when I found a copy of it in the waiting room of the blood bank. It turned out to be kind of a cross between Fine Cooking and Taste of Home — sophisticated recipes with beautiful photography combined with friendly approachable prose and reader submissions. I felt really lucky to find it. Now I’ve only stolen a waiting room magazine once (and that office sort of deserved it for reasons I won’t go into), but I still feel kind of guilty about that, so I vowed not to steal any more magazines and tried to memorize the recipe as I sat in the chair pumping the blood into the little bag. The phlebotomist asked me what I was doing and I said “memorizing this brownie recipe”. Then she said “Oh, just take the magazine with you.” But I’d already memorized it so here’s the paraphrased version. Preheat oven to 350 degrees F. Line an 8 or 9 inch square metal pan with parchment paper of foil. If using foil, spray foil with cooking spray. I used an 8 inch pan. Melt butter and both chocolates in a bowl set over a pan of simmering water. Remove from heat and let cool slightly. Combine flour, salt, baking powder and cocoa in a small bowl. Stir well to mix. Whisk sugar, eggs and vanilla together in a large bowl. Add melted chocolate/butter mixture and whisk until smooth. Stir in the flour mixture, stirring only until it disappears. Stir in nuts if using. Pour batter into the prepared pan and bake for 28 minutes or until brownies begin to pull away from pan. Set the brownies on a rack to cool. Meanwhile, combine caramels and cream in a saucepan and heat over medium low heat, stirring often, until caramels are melted. Remove from heat and stir in the vanilla. Pour or drizzle decoratively over the top. If you end up pouring, you’ll probably want to drizzle some melted chocolate over the top to make the brownies look better. That’s what I did. Otherwise, you can just drizzle the caramel decoratively. Also, if you want to cut these neatly, make sure to chill them for a bit. Caramel is the secret password to instand happiness. Mm! This sounds delicious, thanks for sharing the recipe! Thanks, Anna. I made these today, I used an 8 inch pan and baked at 28 min, same as you. Instead of putting pecans in the batter, I sprinkled mine on top of the caramel. These were very good. I have also memorized a recipe from a magazine, I can’t bear to take the magazine and I absolutely would never rip a recipe out because I hate it when someone else does that! I’m gonna make the cranberry cookies this weekend to bring to a party. Sorry Karen. It was 1/4 teaspoon. These were good, but I thought the cranberry cookies were better. I’m hoping to make these this week – looks like the salt is missing from the ingredients. If you can still remember the amount all these days later I will be impressed! I’m thinking 1/8 or 1/4 teaspoon should do it? Are they worth making? I’m torn between this and the cranberry cookies. I carry a pad to copy recipes, but I have stolen a magazine or recipe out of magazines in an office…and I feel guilty…like the magazine police will get me! Anyway, “Cooking Pleasures” is a great magazine and I am a member of the Cooking Club of America. I have really enjoyed it and I get to test some really neat things! These look like amazing brownies! I’m impressed that you were able to memorize the recipe! Oh yummy!!! These look so good! I’m a brownie fanatic, so I will have to try these. 🙂 I have been so busy with work lately that I haven’t been able to visit and comment that I was before, so i am trying to catch up now! Oh, and I hope to see you join the Cooking with Alicia & Annie blog event this month! When I’m in waiting rooms, hotels or bookstores I use my Blackberry to type out recipes I find in magazines and cookbooks and email them to myself. Very handy! These look delicious. I’m always up for chocolate and caramel together. I don’t think I’ve actually ever stolen a magazine (though I’ve thought about it!!) But I have asked the receptionist if it’s ok if I tear out recipes. Kind of embarrassing! I have to say good memory skils Anna! What a good way to exercise the mind and make the tummy happy! They do look very yummy! Wow! You must be so calm to sit there and still be able to read a magazine, let alone memorize a recipe! 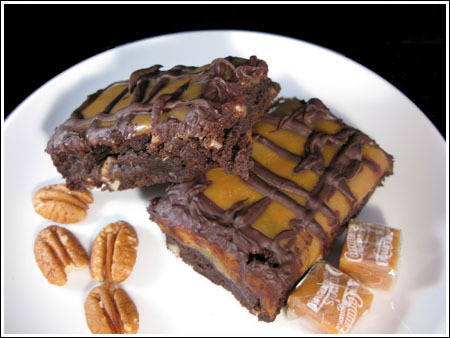 And those pictures look great – are the brownies really sweet? You are so funny! I used to encounter the same dilemma when I was in high school and had monthly appointments with the orthodontist for my braces. I always struggled to memorize the waiting room magazine recipes because I felt too guilty to swipe them. Kudos for the memory job well done. Also – I scored some unwrapped caramel chip-type-things at Target (thanks Katrina for the tip), so I can’t wait to make these! Way to get the recipe! You obviously have a sharp mind to memorize the recipe! I usually just jot down the basics when I see a recipe in a magazine in a waiting room. Once in awhile a nice receptionist will notice me jotting away and offer to photocopy it for me, but I figure if I need a photocopy I might as well go buy the magazine. If it’s a really old magazine I just figure I’ll have to do without it. The pecan squares I mentioned to you are cooling on the counter. I hope there is enough light left by the time they’re cool enough to cut so I can take pictures in natural light. Joanna,the magazines at my gym aren’t worth stealing. VG, I’m sure you could do a caramel version. Also, glad you are feeling better. Therese, let me know what you think about those big fat peanut butter cookies. I really do want to know your opinion. I in wisdom of age have ripped recipes out of magazines in various waiting areas. But only after I had seen that someone before me had taken the perfume samples…so I felt okay about it. You are so funny!! These brownies look amazing!!! I love the combo of caramel and chocolate! I am in the process of making an earlier recipe you had posted…the one with the peanut butter cups. Thanks for making me laugh…you are so funny! Haha!! So funny about your magazine-stealing story.